Keeping your unit working through all sorts of weather. 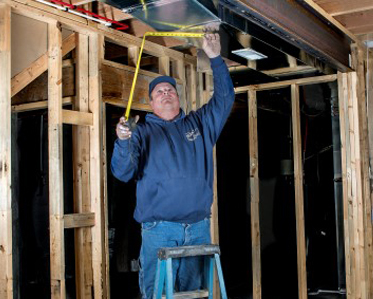 Look forward to heating and cooling your home. Work that's done right, at a fair price, every time. Here are just a few things Burks Service can do for you. Don’t see it on the list? Just ask us, we usually say yes. Another thing you can count on with Burks is that you’ll always start and end with a real, live person. Owner Fred Burks makes sure of it – and he personally oversees every job, so you know it’s done right. After all, Fred’s reputation depends on it. And Fred’s not the kind of guy who wants to have to hide behind his menu or do the grocery store shuffle. Customers who choose Burks Service as their heating and air conditioning experts, get just that – experts. We’ve spent more than a decade in this industry, and we know it like we know all the freckles on each of our children’s faces. But we don’t rest on that. At Burks, everyone from the owner down believes in continual learning in order to stay on top of the latest technologies and keep our skills sharp.